Detroit was full of stark contrasts in 1931. Political scandals, rumrunners and mobs lurked in the shadows of the city's soaring architecture and industrious population. As the Great Depression began to take hold, tensions grew, spilling over into the investigation of a mysterious murder at the boardinghouse of Hungarian immigrant Rose Veres. Amid accusations of witchcraft, Rose and her son Bill were convicted of the brutal killing and suspected in a dozen more. Their cries of innocence went unheeded—until one lawyer, determined to seek justice, took on the case. 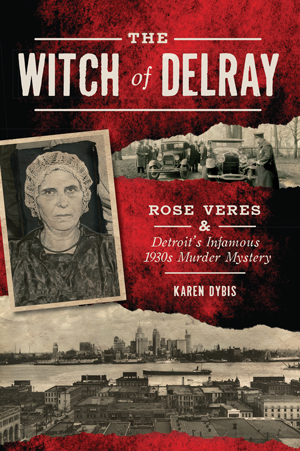 Author Karen Dybis follows the twists and turns of this shocking story, revealing the truth of Detroit's own Hex Woman. Karen Dybis, a former Detroit News reporter and longtime Metro Detroit freelance writer, is the author of The Ford-Wyoming Drive-In: Cars, Candy and Canoodling in the Motor City and Better Made in Michigan: The Salty Story of Detroit's Best Chip.